While supported by the C-CEBH training grant my research has focused on sound localization abilities of juvenile American alligators. Previously, recordings from nucleus laminaris have measured a greater than expected (based on head size) range in interaural time-difference (ITD) sensitivity (Carr et al., 2009). My projects have been designed to determine the role peripheral mechanisms in achieving enhanced ITD sensitivity. I am currently finishing up a data set in which I have utilized an innovative auditory brainstem response (ABR) methodology. 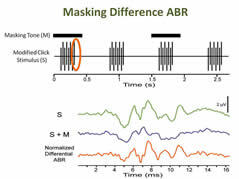 Unlike traditional ABR methods, this methodology involves two speakers and masking tones, which have allowed me to measure directional sensitivity and thresholds to relatively low-frequency tones. Preliminary results demonstrate directional sensitivity of these animals to tones with wavelengths greater than 10x’s the distance between the animal’s ears. The observed directional sensitivity allows us to conclude that the previously measured increased range of ITD sensitivity is at least partially accounted for by a peripheral mechanism. I am also collaborating with Dr. Dan Tollin and members of his laboratory (University of Colorado) to examine the acoustical space around the animal's head. By measuring head-related transfer functions (HTRF) for tones we are able to determine what is received at either tympanic membrane during sound presentation. I have also been collaborating with Dr. Bruce Young (UMass – Lowell) to examine alligator head anatomy. We have been using various histological techniques, fills, and CT imaging to examine connections between tympanic cavities and to sinuses and the Eustachian tube system. Connectivity to tympanic cavities, and possible additional sound pathways, would provide a peripheral, pressure-difference-receiver, mechanism that could explain their directional sensitivity. Since ABR measurements are not as sensitive as behavioral thresholds, I have been working with an undergraduate student to train animals on a forced choice behavioral task. Once completed, this study will allow us to test the directional sensitivity of alligators behaviorally. My research interests involve using physiological and anatomical techniques to study the evolution of the hindbrain and VIII nerve-related structures. The VIIIth nerve is an interesting target for evolutionary neurobiological study because its output is involved in behaviors that are required for survival, and there is evidence of evolutionary changes in both the transducing sensory structures which provide input to the VIIIth nerve and in their afferent targets. Evolution provides us with a great data set with which to study the variability of how such problems can be solved. I am currently studying the role for pressure difference receivers in alligator sound localization. This work complements my evo/devo and electrophysiology background. As a graduate student at the University of Chicago, (working with Dr. Melina Hale), I studied the startle response of fishes (triggered by VIIIth nerve input), using calcium imaging to study larval zebrafish locomotor networks, and from a comparative perspective, measuring and comparing muscle activation, kinematics, and neuro-anatomical structures across species. I also gained excellent electrophysiology and fine dissection experience during my first, brief post-doc with Dr. Eve Marder (Brandeis University). My research is focused on the early development of auditory thalamocortical and intracortical circuits in autism spectrum disorders. Recent brain imaging studies have revealed significant abnormalities in the way that autistic individuals process speech and sound. Specifically, temporal (including auditory) cortical areas exhibit different patterns of activation compared with typically developed individuals, suggesting that improper “wiring” in these areas during development might contribute to problems in speech perception or interpretation. Such faulty wiring could result from abnormal development of the thalamocortical-corticothalamic loop in primary auditory cortex, though this has never been investigated. To test this hypothesis, I am using two established mouse models of autism in which auditoryprocessing deficits are known to be present: prenatal exposure tovalproic acid (VPA),and the Fmr1-knockout mouse, a model of Fragile X syndrome. 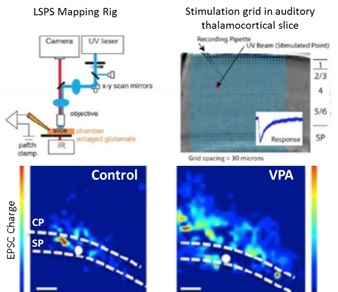 To “map” the connectivity of developing auditory circuits in vitro, I utilize high resolution laser scanning photostimulation (LSPS) activation of caged glutamate in acute auditory thalamocortical slices. Using this technique, I havediscovered abnormal connectivity between the developing cortical plate (CP) and transient subplate (SP) region of primary auditory cortex in VPA-exposed mouse pups beginning as early as the first postnatal week, a period comparable to a human cortex in the third-trimester of fetal development. I am also using in vivo 2-photon functional imaging of calcium and glutamate to determine how fetal thalamocortical miswiring affects the synaptic processing of sound in juvenile auditory cortex of VPA and FRX mice. The results of my research have the potential to reveal the earliest circuit deficits leading the auditory phenotype in autism spectrum disorders.